Get the latest freebies delivered straight to your email! 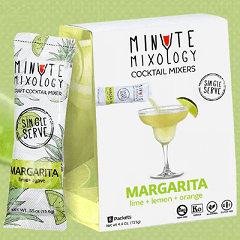 Why not try this free minute mixology mixer sample! With a variety of flavours from margarita, coconut mojito, moscow mule and more. They samples are very easy to use, all you have to do it pour the mixer sachet into the required alcohol to transform it into a cocktail!To get your free sample click "CLAIM OFFER" and follow the steps. WOW Freebies is operated by WOW Media UK Ltd. WOW Media UK Ltd is registered in England and Wales with Company Number 06305560.